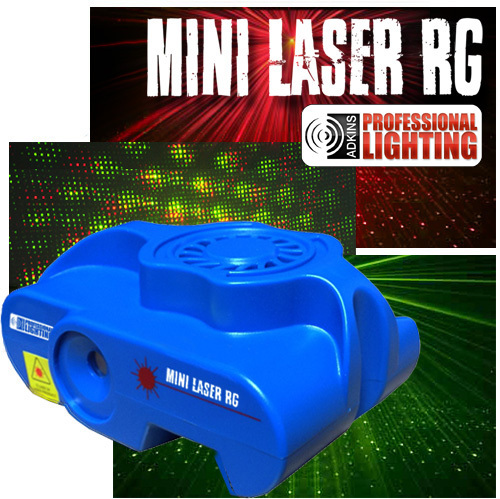 Blue Case - Red and Green Laser , Mini Laser, Auto Active, Adjustable Sound Activity, Sound Control, Strobe Flash, Auto Strobe Flash, w/Tripod, Adapter, Bracket & seat, Power: DC5v 1Amp 100-240vAC, 50/60Hz. Dimensions: 4.61x3.62x2.05". Power: AC120/60Hz & 230V 50HZ Unique mini laser that projects red and green beutiful designs. Operational modes: Auto Mode or Sound Active Mode. Laser patterns can be projected anywhere on a dance floor, ceiling or walls. A great choice for any pub, club, party, bar, etc. With its adjustable bracket, it can be conveniently mounted on walls, ceilings and floors, or you may use the included tripod stand to place it on a desk, a table or even on the floor.